According to the National Institutes of Health, drug-related illness accounts for 23 percent of hospitalizations among the elderly. What causes these illnesses? And how can family members and caregivers help the seniors in their care avoid drug-related illness? As our bodies age, we go through many changes. Some of these changes may alter how different medications affect us. We may also require more medications to treat our various aches and ailments as we grow older. 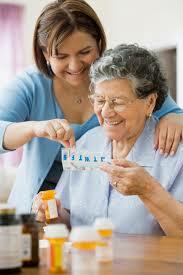 Elderly ones tend to take several medications – both prescribed and over-the-counter – every day. They also experience more side effects, some of which can be very serious. It is incredibly important that seniors and their caregivers keep careful track of the medications that may cause harm. A home care system or home care software, such as ClearCare Online, is an excellent tool for managing medications. The medication management feature of ClearCare Online’s home care system allows home care administrators to securely store all medications, dosages and instructions for each senior client. Caregivers will always know which medicines to administer and when. The American Geriatrics Society offers a list of medications - originally identified by geriatrician Mark Beers – that pose a significant risk to seniors. The “Beers Criteria” is meant to be used a guide, but may not apply to all patients in every situation. Caregivers may want to save a copy of this list in their home care software or home care system for reference. In addition to cross-referencing medicines with the Beers Criteria, experts recommend each senior (or their caregiver) create a list of their current medications and bring it along each time they visit their doctor. Caregivers can set a reminder for the appointment, and to bring the medications list, in their home care software. Be sure to include all medications – including vitamins and supplements – and their dosages. If there is ever a question about a medication or its side effects, always consult with your doctor before changing or stopping the medication. Caregivers should be alert to any drug-related reactions and make a note in their home care software. ClearCare Online’s home care system also allows family members to stay involved in their loved one’s care. A secure, web-based portal gives them confirmation of the caregiver’s arrival and real-time updates on all daily activities. Communication between all care team members is made easy with a reliable messaging system. There is no question that medicine can help us when we are sick or coping with a chronic health issue. But care must be taken so that all medications are administered properly. For seniors who live at home with the help of a home care system or home care software, like ClearCare Online, a reliable medication management tool is an excellent way to avoid drug-related illness.